In 2018, the Asia-Europe Foundation (ASEF) Public Health Network and Ministry of Foreign Affairs of Japan are co-hosting a multi-country, High-level Meeting focusing on Universal Health Coverage (UHC) in relation to effective management of infectious diseases including possible future pandemic as well as Antimicrobial Resistant (AMR). To agree on priorities for international cooperation between Asia and Europe to support an equitable and sustainable approach for addressing the challenge of infectious diseases. This High-level Meeting will take place on 30-31 May 2018 in Tokyo, Japan. The planning of this meeting was developed in cooperation with the Coordination Office of Measures on Emerging Infectious Diseases, Cabinet Secretariat, the Government of Japan, the Ministry of Health, Labour and Welfare Japan, and Wellcome Trust. The Asia-Europe Foundation Public Health Network (ASEF PHN) and the Ministry of Foreign Affairs (MoFA) of Japan hosted the 10th Anniversary Event: High-level Meeting on UHC - "UHC as a Tool to Combat Infectious Diseases" on 30-31 May 2018, in Tokyo. The event marked the milestone of the 10th anniversary of ASEF PHN as part of ASEM initiative for the Rapid Containment of Pandemic Influenza, which began at the 7th ASEM Summit (ASEM7) in 2008 with the leadership of the Government of Japan. 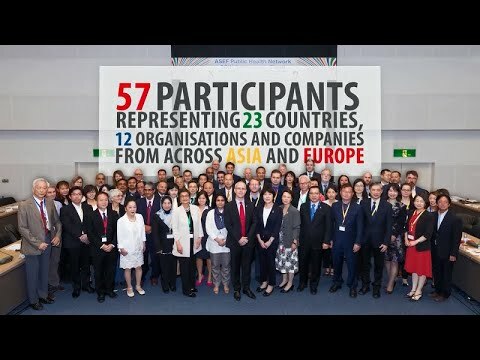 The High-level Meeting gathered 57 participants representing 23 Asia-Europe Meeting (ASEM) Partners and 12 organisations and companies. Mr Manabu HORII, Parliamentary Vice-Minister for Foreign Affairs of Japan and Dr Yusuke FUKUDA, Director General of Health Service Bureau, Ministry of Health, Labour and Welfare of Japan delivered opening remarks; while Dr Naoko YAMAMOTO, Assistant Director General of the World Health Organization provided a keynote speech. The Meeting put a spotlight on the importance of making progress towards UHC and the role it plays in containing possible health emergencies. What made it distinct was how its explored the interlinkages between UHC and Antimicrobial Resistance (AMR), which are two important topics on global health. The Meeting underscored that the two health priorities – pursuing UHC and addressing AMR – could not be achieved in isolation from the other. It also sought an agreement on priority actions for cross-country cooperation between Asia and Europe. To know more about the successful event, you may read the article of the World Health Organization South-East Asia Regional Office (WHO SEARO) here.